It was founded during the 8th century A.D., and it was originally located at Hiei-zan (比叡山). It had “moved” several times and finally settled at the current location in 1871 A.D. The name, “Sanzen-In”, has been used since then, and one of the previous names had been, “Kajii-no-miya (梶井宮). Sanzen-In is the Buddhist temple of Tendai-sect, and it is a monzeki temple. Monzeki (門跡) is a term applied to the temples where the aristocratic or Imperial family members had become the head priests. The term is also applied to the Buddhist priests with such lineage. During the 16th century A.D., Kanamori Souwa (金森宗和) had visited Sanzen-In, he was stuck with the beauty of the nature seen from the guest house, and he decided to transform it into a garden known as the Shu-heki-en. It is a so called Souwa school garden. It is interesting to note that this school is known for the tea ceremony and not for the gardening/landscaping. In this image, you can see that some of the azelea flowers are starting to bloom. Soon the garden will be covered with the azelea flowers of the different colors and shades. 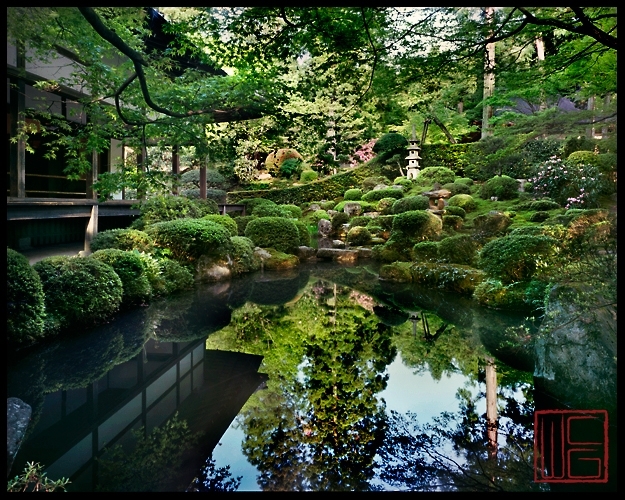 The reflection of the temple structure and the garden on the surface of the pond appears magical as if to show the parallel realities of the world above and below. By meditating on the reflection of the pond, one can be guided to the splender of the real world, and at the same time the reflected image may stir our curiosity and ponder about the world below.